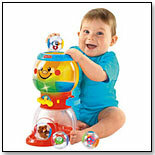 TDmonthly® - New Toys and Games: Roll-A-Rounds Swirlin' Surprise Gumballs from FISHER-PRICE INC. 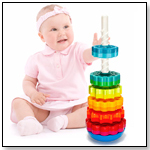 Babies can take one of four, clear plastic gumballs, each filled with colorful plastic animals and objects rolling around inside, and pop them in the top of this large plastic gumball machine. By pressing a lever, the gumballs hurl down the machine accompanied by lights, music and silly sounds. They can click a knob for more activity. The machine takes three AA batteries, not included.